A landmark on the beautiful island of Maui for the past two decades, Grand Wailea, A Waldorf Astoria Resort, is announcing a $30 million rennovation – which includes all new guest room interiors as well as upgrades in the hotels meeting areas and it’s famous pools with a completion date set for early 2015. 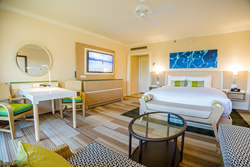 Known for reflecting a stunning blend of Hawaii’s culture and natural beauty, the upgrades are designed to further enhance the guest experience with a fresh, contemporary island look. Room design updates are being headed by esteemed interior architect Robert Barry of the Los Angeles based Barry Design Associates (BDA) who won the account via a design competition. The firm was behind the luxuriously iconic look of the resort’s Spa Grande and has worked on hotels & spas including: the One & Only, Bahamas, the El Conquistador Resort in Puerto Rico, the Mauna Kea on the Big Island in Hawaii, the Beverly Wilshire Spa and the Naples Grand Beach Resort. Sustainability is a focus of the room reimagining with: LED lighting used throughout and all carpet being made from recycled material, including bed accent carpet made of recycled nylon fish nets from the islands of the Pacific. Carpet “tile” is being used throughout the rooms so each can be replaced individually as needed. Barry says the overall design focuses on a clear but subtle sense of place, translated in a sleek, modern aesthetic. For instance, the color “story” for the room palette is derived from the island of Maui and its surroundings with: the green scheme from the lush landscape of Hana; the auburn/brown and gold scheme from the colors inside the Haleakala Crater and the coral scheme for the reefs that surround the island. The platform bed and wicker style furniture is fitting for the resort’s tropical setting. The theme of the featured artwork – curated by Nancy Caslin Art & Design – is water and surfers, including a photograph of the Hawaiian native, Shane Dorian, who is in the Surfers Hall of Fame. The art is printed on canvas and stretched around wood without a frame, allowing the images to be quite large. Research was also used to ensure that the room features appeal to today’s traveler who comes even on holiday equipped with cellphones, laptops and iPads – all of which need to be charged. The room has regular outlets and USB chargers built right into the desk and the nightstands, which is especially important since the mobile phone most often doubles as an alarm clock for this demographic. There are even USB ports on the flat screen TV’s for ease of viewing trip photos, accessing emails, music, etc. o Fresh artwork – regional and local artists. o Bathrooms – new tile, vanity, lighting and flooring – including new trim in golden onyx and natural stone, new towel unit under the vanity and an electric, lighted mirror – making them comparable to the newest hotel offerings in the world. o To Reduce Energy Consumption: Installation of 37 new variable-frequency drives and pump equipment to adjust water flow in the pools, requiring less electricity to operate. Since opening in 1991, this majestic, landmark resort consistently ranks among the world’s best in leading travel consumer reports and by industry peers. Nestled on 40 acres of lush, tropical gardens fronting Wailea Beach, this Waldorf Astoria Resort provides a range of vacation experiences: open spaces for the active vacationer, beauty and seclusion for romantic getaways and family fun – ranging from a fully equipped camp for children and a teen lounge to rope swings and a jungle-style river pool. Just 35 minutes from the Kahului airport, this idyllic Hawaiian resort features 22 elegant outdoor function spaces, seven unique event facilities – including an elaborate seaside wedding chapel – for remarkable events, business conferences and destination weddings. With 9 different restaurant and bar outlets, including the thatched-roofed Humuhumunukunukuapua’a – built over its own oceanfront saltwater lagoon and voted "Maui's Best Resort Restaurant" by the readers of The Maui News – and the hotel’s stunning, open-air, art-filled lobby with its trompe l'oeil Botero Bar. Guests also have access to the luxurious Spa Grande, a standard-setter in the world of resort spas, as well as five different world-class golf courses and the finest tennis facilities on the island. Accommodation options also include an enclave of 120 luxury villas called Ho’olei’ ranging from 3,200 to 4,000 square foot, which are located directly across the street from the resort. Waldorf Astoria Hotels & Resorts is a portfolio of more than 29 landmark destinations, each being a true reflection of their surroundings in the world’s most sought after locations. Unified by their inspirational environments and unparalleled guest service, Waldorf Astoria creates unforgettable moments through the delivery of True Waldorf Service. Personal Concierges deliver unparalleled, bespoke service from the moment a guest books through check out. Waldorf Astoria is part of Hilton Worldwide, a leading global hospitality company. Experience Waldorf Astoria by booking at http://www.waldorfastoria.com or http://www.waldorfastoria.com/offers. Learn more about this expanding portfolio by visiting http://news.waldorfastoria.com.